There are moments when a simple bowl of cereal, just won’t do the trick at breakfast time. There are also times when your diet dictates what you can or cannot have, and traditional carb-heavy breakfast items do not make the cut. Today’s Keto Breakfast Egg Wrap Recipe is an ultra low carb option, that is high in fat and protein to keep you feeling full and burning fat throughout the day. Made with just five simple ingredients, these ketogenic sausage and cheese rolls are easy to whip up in the morning. Yet they also make great leftovers, so you can cook and roll them the night before, then just grab one to-go in the morning! When following any sort of low carb diet it can be easy to feel frustrate over the favorite foods you must eliminate. This Keto Breakfast Egg Wrap Recipe mimics a classic sausage roll. 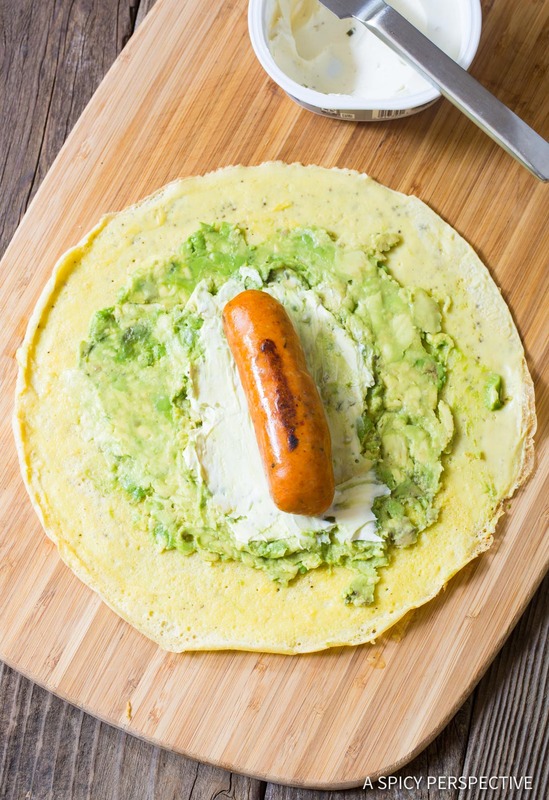 Yet instead of yeast bread wrapped around sausage, here we have a thin egg crepe and ripe creamy avocado. 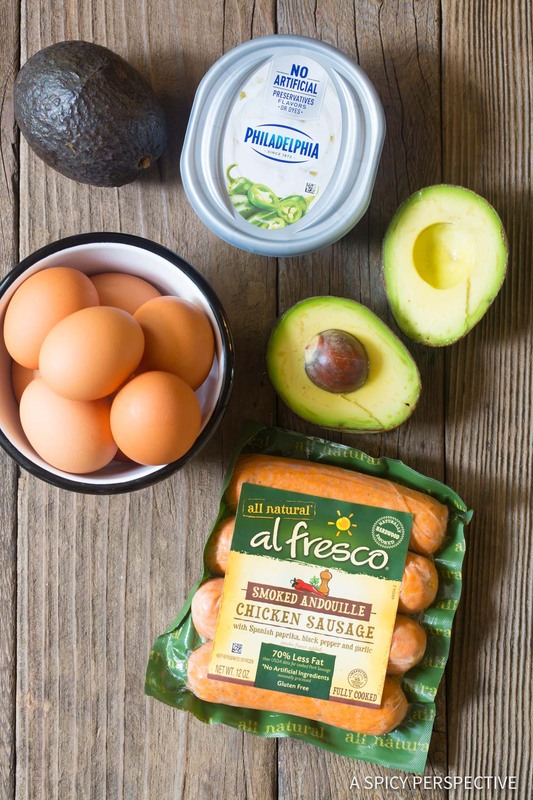 The combination of scrambled eggs, juicy chicken sausages, spicy jalapeno cream cheese, and soft avocado is the perfect blend of comfort and excitement! You won’t miss carbs a bit, when you make this breakfast. 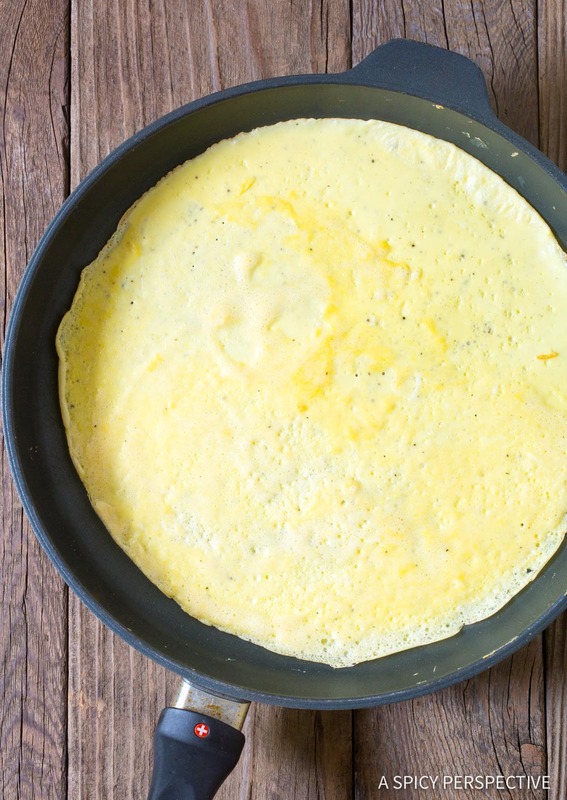 The key to making fabulous egg wraps is to master the art of making an egg crepe. First whisk the eggs with salt and pepper until frothy. Then pour the egg mixture into a nonstick skillet with a little bit of melted butter. 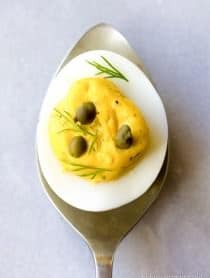 Swirl the egg around until you have a thin even layer covering the pan. Once the edges are crisp, use a silicone spatula to flip the crepe. 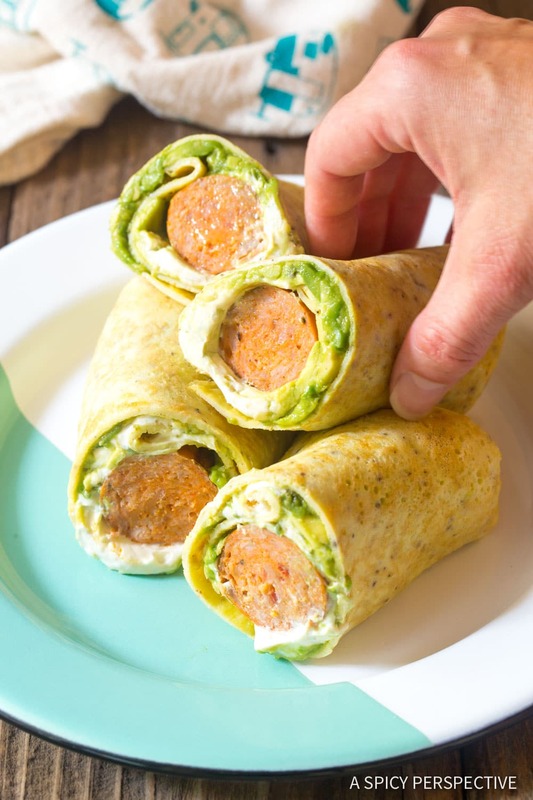 Once all the egg crepes are made, simply spread on the soft avocado and cream cheese, place a warm sausage in the middle and roll it up like a burrito! Make sure to fold the sides in as you roll your keto wraps so the fillings are enclosed. 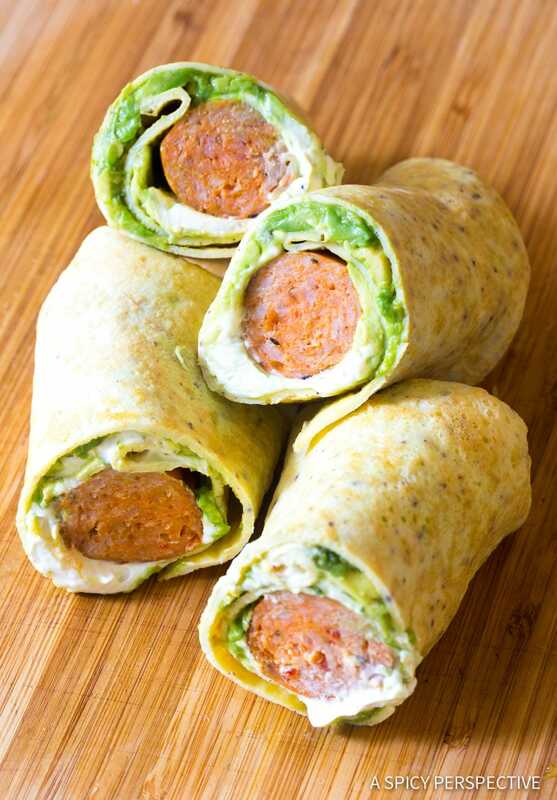 You can roll each wrap in plastic and refrigerate for easy grab-n-go breakfasts. Double or triple this recipe to last all week. Our Keto Breakfast Wraps are great cold or warm. 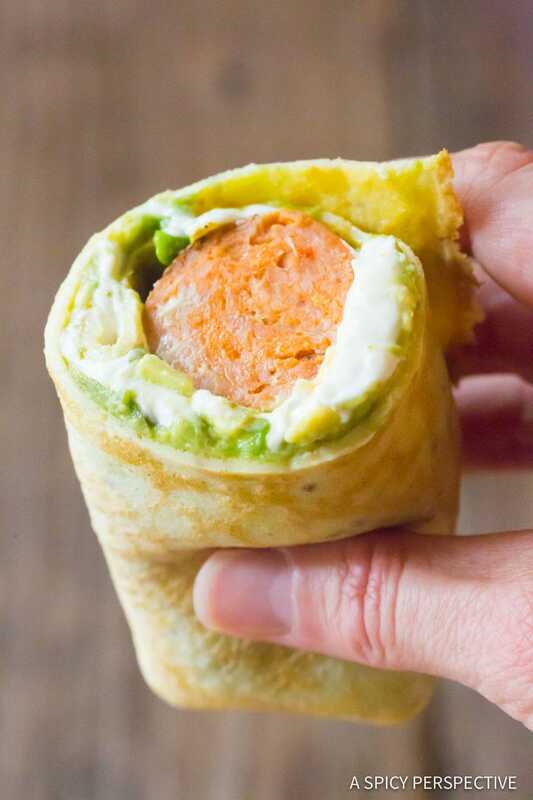 Low Carb Keto Breakfast Egg Wrap Recipe, stuffed with sizzling chicken sausage, avocado, and jalapeño cream cheese! This filling meal makes great leftovers and lunchbox wraps. Place an 11- to 12-inch nonstick skillet over medium-high heat. Once hot, place the chicken sausages in the skillet and sear to warm through. Then move them to a plate and cover with foil. Wipe the skillet out with a damp paper towel. Crack the eggs into a bowl, making sure you have 2 cups worth. Add 1/2 teaspoon salt and 1/4 teaspoon black pepper. Whisk throughly until the eggs are frothy. 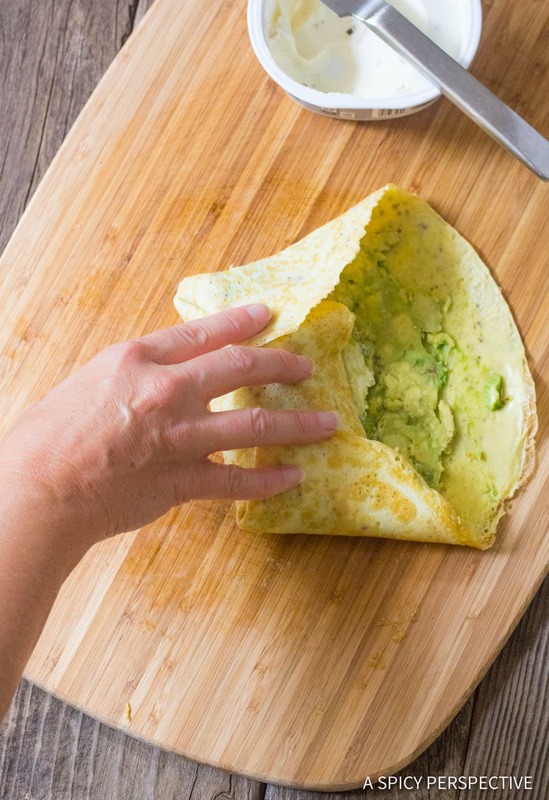 Lay each egg wraps flat and scoop half an avocado on the wrap. 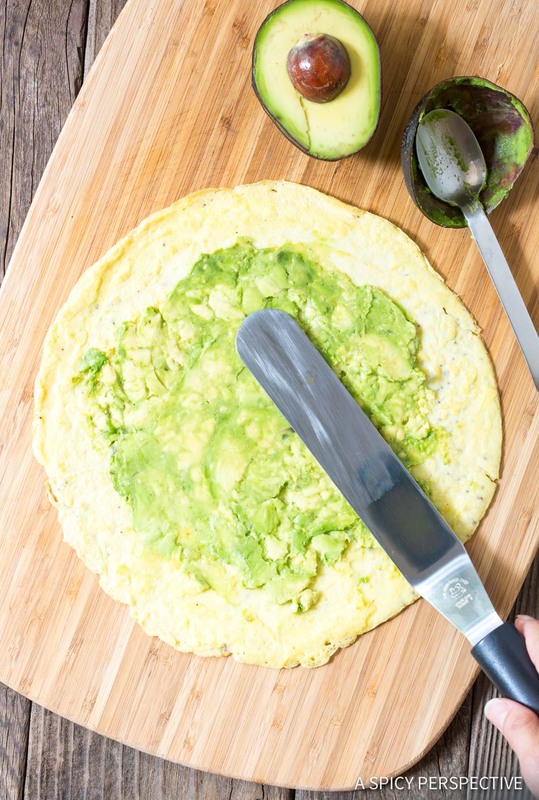 Spread the avocado into a thin layer. Then spread 2 tablespoons of jalapeño cream cheese over the avocado. How could you make these recipes? Yes, like you, I’m also curios. I really tried cooking/making this and it really is the best. 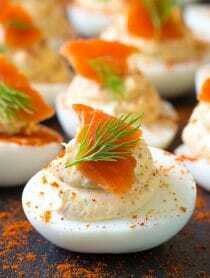 I was able to come up with a very delicious menu that can be very helpful for in making snacks in mid-day activities. Hey new follower and so happy! Saw your newest tutorial and 10 min later this was on my plate! 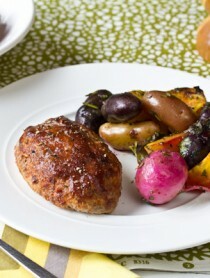 Taste delicious and so quick and easy! 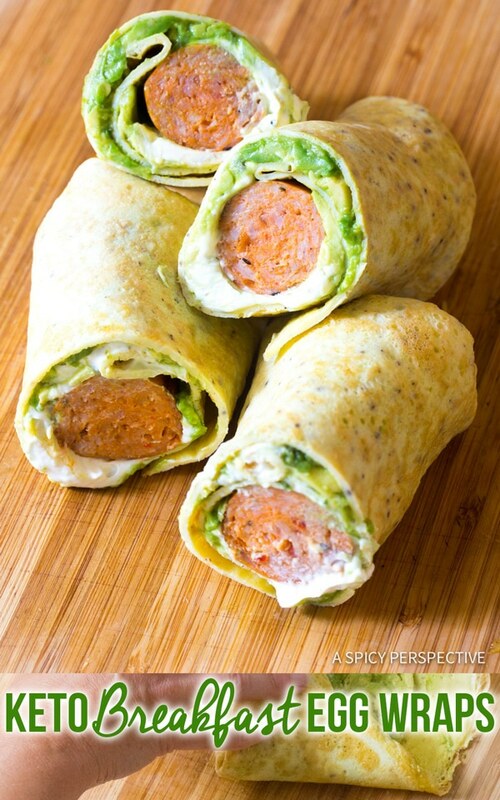 wow, this works so wonderfully with my daily “slow carb” dose of eggs (I’m a little sick of eating them fried) with the other veg components too like avo, and nice to know about these sausages too, love the roll up that’s much better than a tortilla, than you!